Couching is wonderful technique that many embroiderers forget about but it is easy to do and a wonderful way to use interesting textured novelty threads in your embroidery. 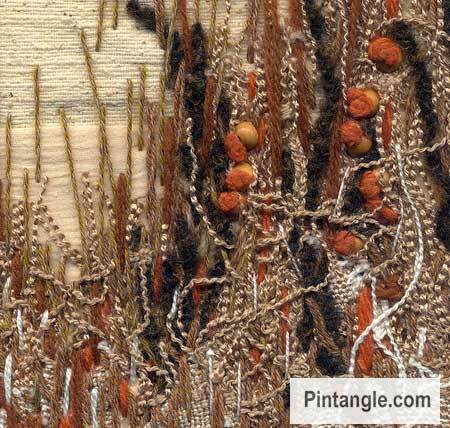 You can create wonderful surfaces by couching down threads and then embroidering over the top of them. 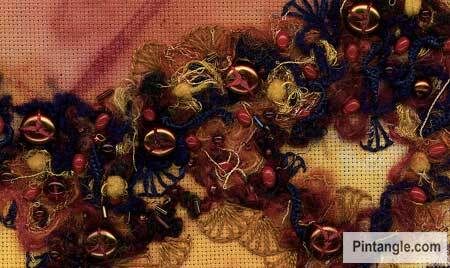 Combined with beads and textured stitches in interesting threads you can make your embroidery pop. It is quick to work, easy to do, a heap of fun, and opens many doors. Couching is used in Laidwork and also known as convent stitch and kloster stitch. With couching, a surface thread is laid on the fabric, and anchored using a second thread. I have used a contrasting thread so the couching can be seen but normally you would match the colour. 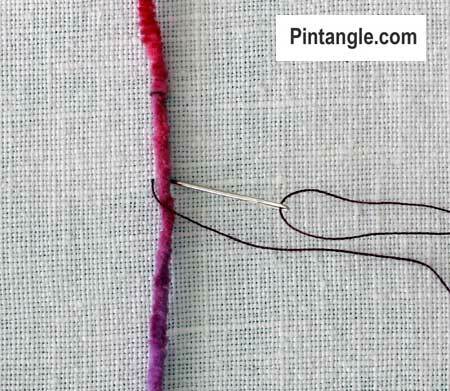 Use a large eyed needle to bring the heavy thread through the fabric. Using a finer needle and thread at regular intervals make small, straight stitches over the thick thread to secure it to the fabric. Work in this way until you have completed the line or filled the area. Take the end of heavy thread to the back of the fabric using a large eyed needle. Secure both ends with small stitches using the fine thread. Do not clip the heavy thread too close, otherwise it will pop up to the surface. There are many ways to use couching. You can create patterns of the thread itself. 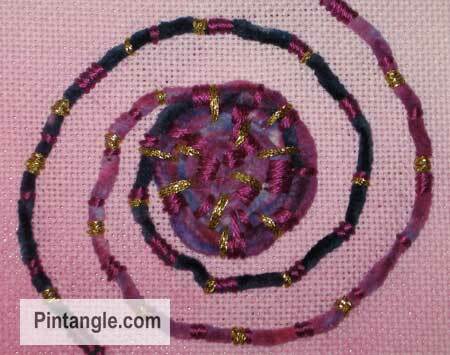 In this case I have used a metallic thread to couch chenille thread in a spiral pattern. Couching is ideal for attaching highly textured or thick threads the foundation fabric building up rich complex decorative surfaces in a freeform manner. In the sample below I couched a blue chenille yarn and novelty knitting yarn to a hand painted fabric and then covered it with textured embroidery and beads. This example of couching is used to create a pattern along a crazy quilt seam. The metallic yarn was too thick to stitch with so I couched it down in zig zag pattern before adding beads. 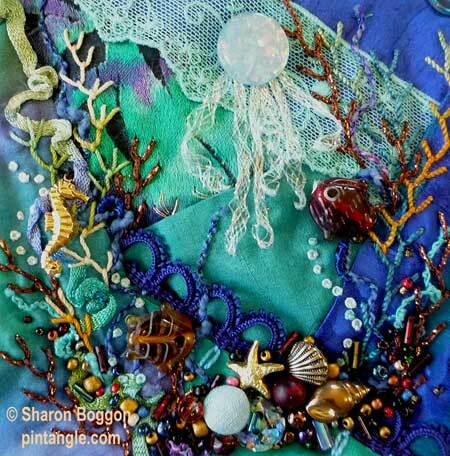 Here is another example of couching used on a crazy quilt block. The seaweed is made up of novelty threads couched tot he surface and the tendrils of the jelly fish is also made of couched threads. This is a block on my I dropped the Button Box Quilt. You can read more about block 81 here. This last example of couching is a small scene of summer grasses. It is mainly made up of couching, straight stitch worked in free form manner, French knots and wooden beads. I hope I have given you a few ideas on how to use couching in a contemporary way. Week 10: Couching metallic floss turned out to be easier than stitching with it! Couching stitch (with chain and the next 3) are found here. I’ve posted about the Couching Stitch at my place. made it a day late but i am glad i persevered, as i liked the end result. My first try at Couching stitch… I liked this stitch. Hope you'll all stop by for a visit!! Couching on Japanese. Here's a bit of cross culture for you – Celtic design on a Japanese temari ball with a Medieval (English?) technique of couching! Chain Stitch and Couching. Enjoy! What a lot of wonderful work the TAST project is generating. It is such an inspiration to read the comments and learn from others. Thank you all for sharing. Did anyone couch a couch yet? I figured Luis would have done that. I enjoy seeing both the meticulous samplers and the pieces that tell a story. It's all great. I have used couching in previous samples/posts. See if you can spot where! One more post for Couching! I created a sampler page for my book and played with a maze. Here is the link for my trials of couching..
Just a sneak peek on my blog of the project I'm working on. This stitch was just what it needed! This is all from me this week. Next week I will attend a spinning cours at Sätergläntan, Dalecalia, Sweden. http://www.saterglantan.se/index_en.php (if you ever come to Sweden put Sätergläntan on your wish-to-see-list). I am sure we will make some intresting yarn, suitable for coaching, but i doubt there will be time for stitching the new TAST-task. My couching sample is from a sketch of a wood grain pattern. This weekly challenge is making me stretch my stitching boundaries. I thought I had added a comment here but I must have hit the wrong button. Had fun with this one. I've added some couching to some of my current works in progress. J'attend la semaine 10 ! Here is my couching sample and posted on my blog. It is so good to make sure I post every week it keeps me on my toes. Still so much fun. I really enjoyed doing this. I had fun! Couching is a stitch I love! 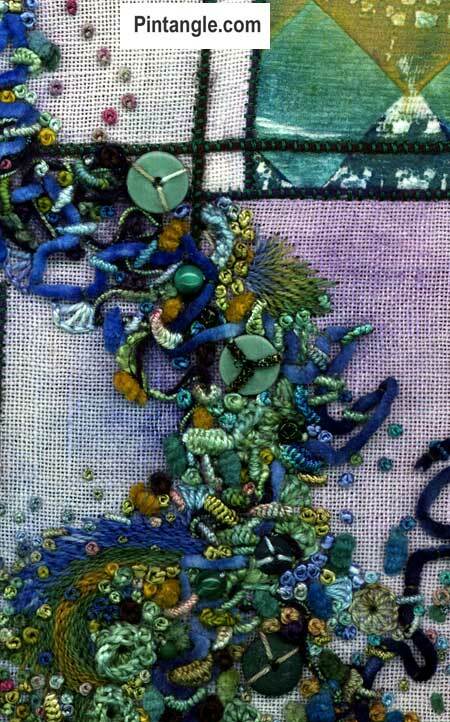 Here http://6stem5.canalblog.com my Tast page and an old work I stitched for a online class. And now, I will visit the other blogs …. I have done only one small couching exercise. My combined work for the month is on my blog. My second attempt for couching. with a especial participation of Photoshop's extrude filter! A very new stitch and concept for me this week, I gave it a go at: http://christinaroland.blogspot.com/2012/02/tast-week-9.html. I also uses all 5 stitches of january on a little naive freehand work, and blogged about it on: http://christinaroland.blogspot.com/2012/02/tast-overzicht-januari.html. Tonight I start working an the four stitches of february, hope to mention that work here in a month. I had given my hands into couching. I uploaded in my blog. I like to stitch varity of stitches and happy watching others. My couching can be seen on my Flickr account. both this weeks and last weeks TAST a bit of comination of the chain and couching and also detached chain and chain. Not a lot as the arthritis in my wrist is not letting me do too much at the moment. Here is my post for this week. I created a couched snail with flowers. Just put my stitch photo on flickr group. I love couching! Perfect for crazy quilts. I love couching. One can do such interesting things with it. I am watching the TAST challenge closely and it makes me wish that I had the time for it. Very fun.